Many teachers have adopted a “flipped” model of instruction, where students view lectures from home and then use class time for discussions, experiments, and problem-solving. I have not fully gone to this model because many of my lectures have been redesigned as cases and include information with a discussion and a problem to solve. I do have students watch some videos to supplement these activities in class, though it can be difficult to get students to watch the video and come to class prepared to discuss it. 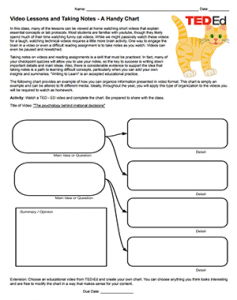 This worksheet is designed to show them a template for taking notes when they watch an instructional video. This activity requires students to watch a TED-Ed video about the brain and irrational decisions and to complete the provided graphic organizer. You could also change the video to watch something you might find more interesting, the idea is to model for students how they should be taking notes when they watch videos and how those notes can be used to help further a discussion in class. The activity asks students to pick another TED video and create their own chart, allowing flexibility with how they take notes. They don’t need to use the exact same chart! The next day, students will share what they learned from the video they chose. Youtube videos can also be used, I chose TED videos because they are usually high quality and educational. Students can go directly to TED-Ed to choose a video from any of the categories and they will be well made and informative.